Why the Glacial Ice is Blue? One of the attractions of the glacier is the beautiful blue colour of its ice. In the upper reaches of the glacier the ice can be up to 300m thick. The upper layer is snow. When this reaches about 16 – 20m deep the snow compresses under its own weight and all the air is squeezed from between the snow crystals, forming glacial ice. Glacier ice crystals contained in solid ice scatter blue light (due to its shorter wavelength) more strongly than red and yellow light (which is being absorbed), giving the glacial ice its distinctive shades of blue. The deeper the light has to travel through the ice, the more red is absorbed and just the blue light survives to give us a deep blue shade. It is the same principal as why water appears blue to us. Green, being on one side of blue in the light spectrum, can sometimes cause the ice to appear greenish. On the other side of blue is the colour violet. The ice does not appear violet to us because the photoreceptors in our eyes have a peak in sensitivity at around 450nm (blue colour). What does ice look like to birds, which have a peak in sensitivity of about 370nm (UV light)…? This entry was posted on 09/05/2010. 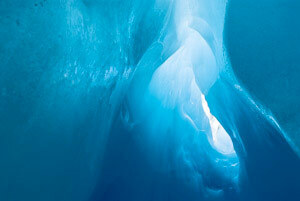 It was filed under Glaciology and was tagged with blue, cave, colour, Franz Josef Glacier, ice, tunnel, Westland NP.